On the top of a bookshelf in my den, I keep an old cardboard shipping box with the seeds my Dad ordered back in 1987 for a garden he wouldn't end up planting in its entirety. The seed packets, some still unopened, make a soft rattling sound as I look them over to remind myself of what he liked to grow. Some of the packets are still unopened. Others he opened and planted early that spring. On the packets of tomatoes and eggplant, Dad wrote "sown Feb. 22nd". He did like to start his tomatoes inside much earlier than I generally start mine. On a packet of peas, variety 'Green Arrow', he wrote "sown on Mar. 6 with onions". That's the packet of seeds I used several years ago to figure out why my peas never seemed to be as good as the peas he grew. When I saw that packet, I realized I was sowing my peas too late and I just hadn't picked a good variety. Now, of course, I always plant 'Green Arrow' peas around St. Patrick's Day, March 17th, and have great success with peas. Thanks, Dad. I looked over those seed packets again this evening, on the eve of what would have been Dad's 88th birthday, and discovered a packet of Amaranth seeds, unopened. I don't remember him growing Amaranth before so it must have been a plant he wanted to try. Or maybe, while looking through the seed catalog, I pointed it out and suggested he grow it. Either way, now that I know he was going to grow some Amaranth that year, how can I not grow some in my garden this year? Never mind it never occurred to me before. Never mind I've already ordered seeds galore, enough for two gardens. Never mind all that. I'll find a spot now for Amaranth, too. Dad was going to grow an Amaranth variety called 'Illumination'. 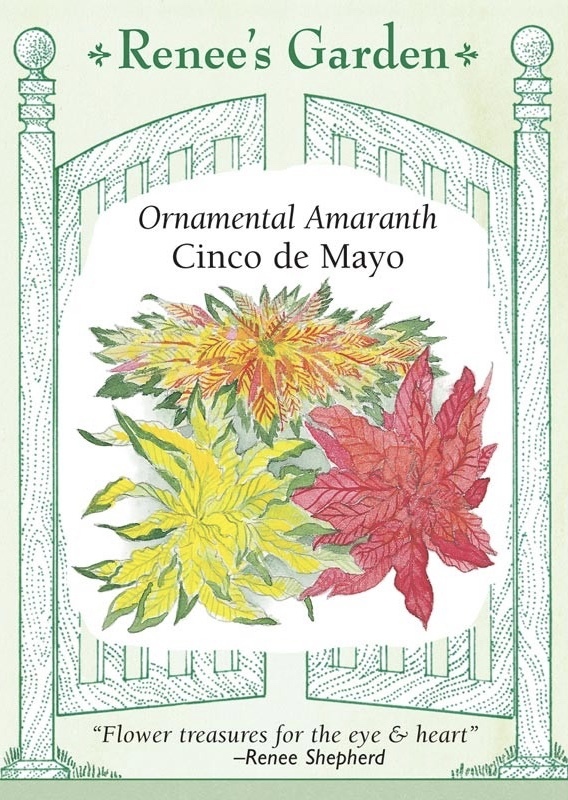 I've decided to try an Amaranth variety called 'Cinco de Mayo' from Renee's Garden. It will add some nice color along the back row of the garden, where I grow zinnias, marigolds, sunflowers, hollyhocks and now amaranth. And while I'm sowing the seeds for 'Cinco de Mayo', I may open this 29 year old seed packet of 'Illumination' and see if any of those seeds will germinate. Why not? I have nothing to lose in doing so except a little time. Of course, I'll keep the seed packet, regardless of whether or not the seeds inside germinate. It will remind me again how blessed I am to have a Dad who gardened, and let me garden with him. My dad was also a gardener. I have a few dried hydrangeas from the last garden he ever tended ... and they are precious. I also had found old seeds in his shed, a few years back, but, alas, none of them sprouted. My dad was a vegetable gardener, while my mother was the flower gardener. I get very excited looking through garden catalogs and displays of seed in the stores. Carol, what a wonderful memory of a Dad who gardened. I can almost picture him going through his box of seeds, a compilation of dads at kitchen tables or in recliners, or even pottering around in basements we can recall from past years. Thanks for jogging my own Dad memory visual. What a treasure to have your dad's old seed box! I wonder what conclusions my children would draw from my seed box. I haven't yet purchased my seeds for this year. Normally, I would have rushed to this task, but we are unsure if we'll be here to enjoy the garden this year. Hopefully the job situation will resolve itself soon so that I know whether or not to get my seeds. It's one of the first things I'll do when word comes about this job!